A couple of weeks ago when I was writing out the grocery list, Hemant said, How about breakfast for dinner? When my husband makes this request, he’s NOT talking tofu scramble! ‘Breakfast for dinner’ is code for Let’s gorge ourselves on some sugar! Thus, this vegan Apple Cinnamon French Toast recipe was born. It’s sweet, fruity, cinnamony—and really delicious. Ah, the things we do for love. ? I’ve never been big a breakfast eater, and I’m definitely not a pancake girl. (I enjoy eating them a whole lot more than cooking them.) Right behind frittatas, French toast has always been my go-to ‘big’ breakfast dish, probably because it’s so idiot-proof—at least it was before I became vegan. Without eggs to firm everything up, vegan French toast can devolve into a slimy, mushy mess in a hurry. Or, as in the case of one recipe I’ve tried, the bread wouldn’t soak up the batter ingredients, leaving me with a plate of hot, damp bread. I’d just about abandoned the idea altogether when I got this idea for vegan Apple Cinnamon French Toast. If you’ve checked out other recipes on this blog, you’ve probably guessed I’m kind of in love with my Vitamix blender. In vegan cooking, we have to go to some effort to transform or replicate the textures of certain ingredients. This is where a good blender becomes invaluable. In this recipe, blending the batter helps us get more apple flavor into our vegan apple cinnamon French toast. And, it helps incorporate flaxseed into the batter, for bit of that thick, ‘slimy,’ texture we’d normally get from the eggs in traditional French toast. I’ve seen some vegan French toast recipes that use nutritional yeast or other ingredients to lend an ‘eggy’ flavor. I did nothing like that here. Rather, I went full-throttle, whole-hog, nearly over-the-top-sweet. If you’re like me and can reach the point of overload with just a little sugar, the optional toasted walnuts help balance the sweetness here. 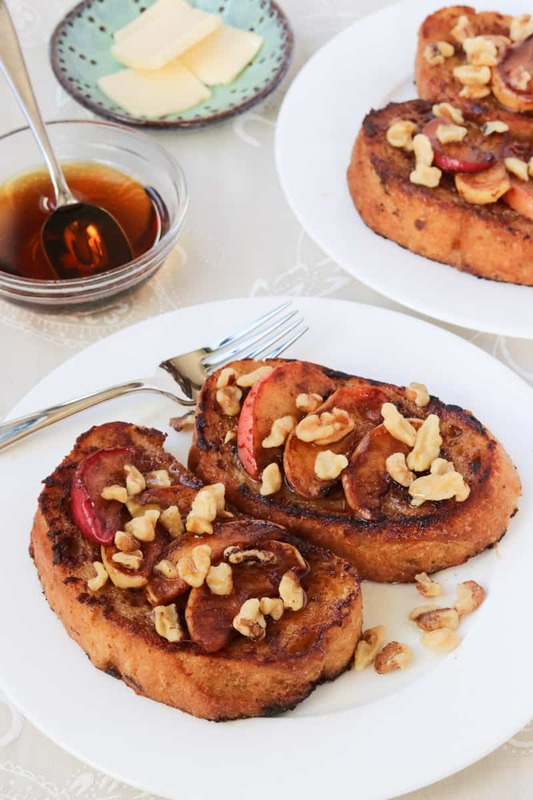 Is this apple cinnamon French toast healthy? Well, there are no eggs or refined sugar, and the butter is vegan. And you could use a light wheat bread, but I’ll admit, I made an exception to our ‘no white food’ rule and used a Country loaf. So I’d say it’s certainly healthier than traditional French toast. 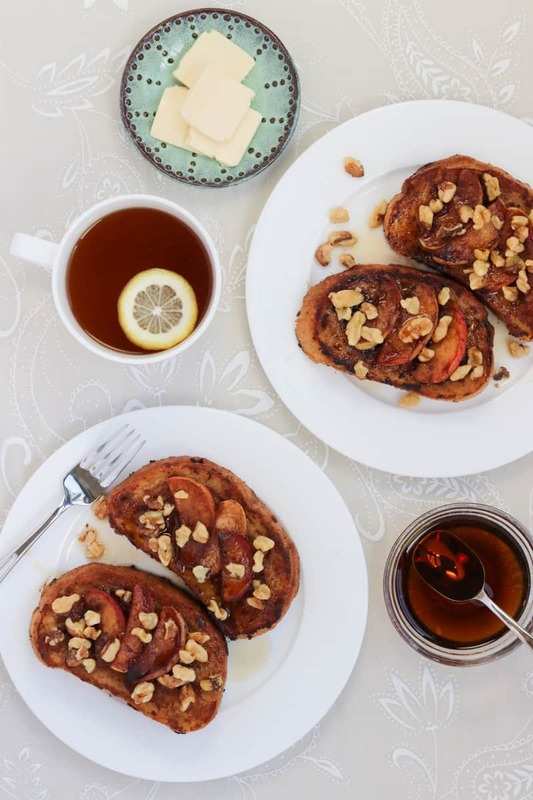 Next time you’re feeling rebellious and craving something sweet, cook up some vegan apple cinnamon French toast for dinner. 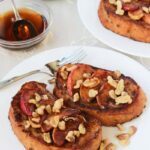 Apple Cinnamon French Toast is vegan, sweet, fruity, cinnamony and delicious for breakfast--or anytime. Optional: Serve with toasted walnuts vegan butter and maple syrup. Heat 1/2 tablespoon of vegan butter in a non-stick skillet over medium heat. When melted, add 1 tablespoon of coconut sugar, 1 tablespoon of cinnamon and the salt, and stir together. Add the apple slices and stir until thoroughly coated and bubbly, about 1-2 minutes. Add 1-2 tablespoons of water to keep the sugar and butter from burning. 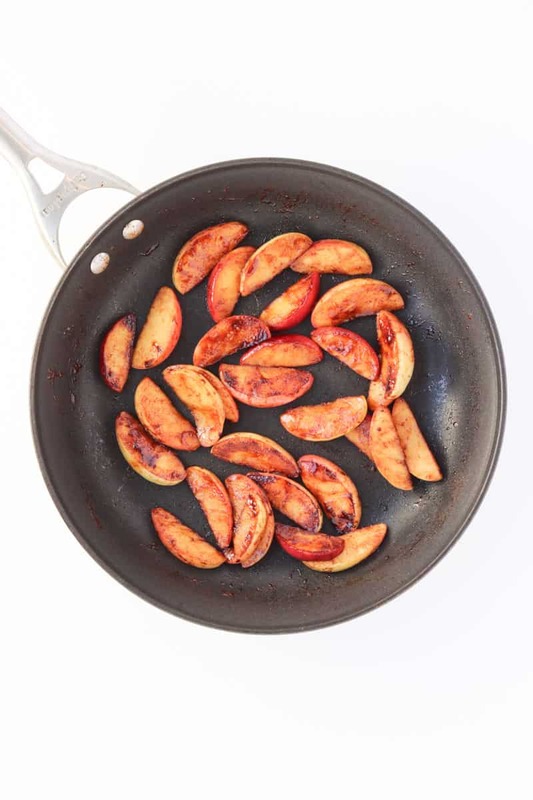 Reduce heat to medium-low, and cook, covered, stirring occasionally, until apples are tender, about 10-12 minutes. Reserve about 18 apple slices (3 per piece of French toast) and set aside. 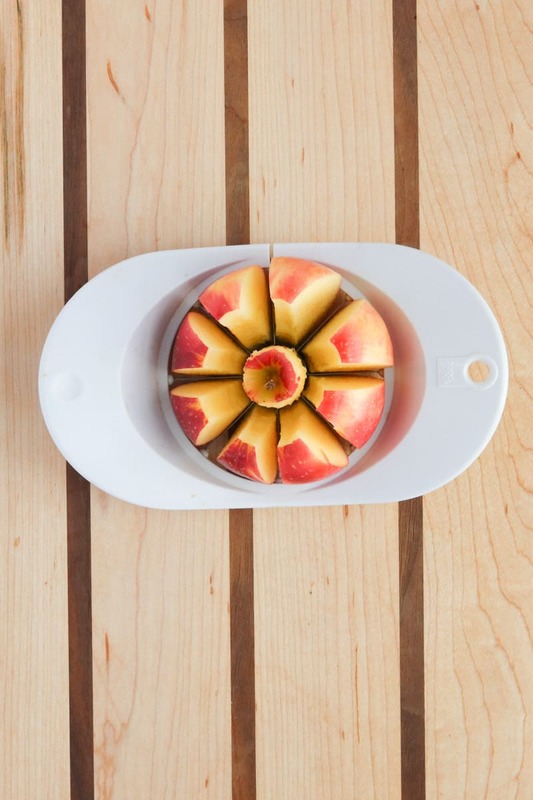 Place the rest of the apple slices (about 3/4 cup) in a blender. 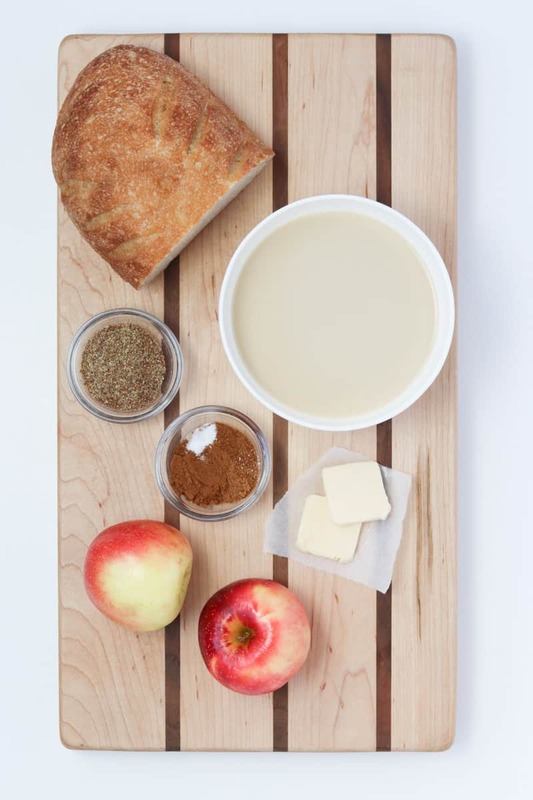 To the blender with the apple slices, add the oat milk, 1 teaspoon of sugar, 1 teaspoon of cinnamon, and 2 tablespoons of flaxseed. Blend for about 30 seconds. 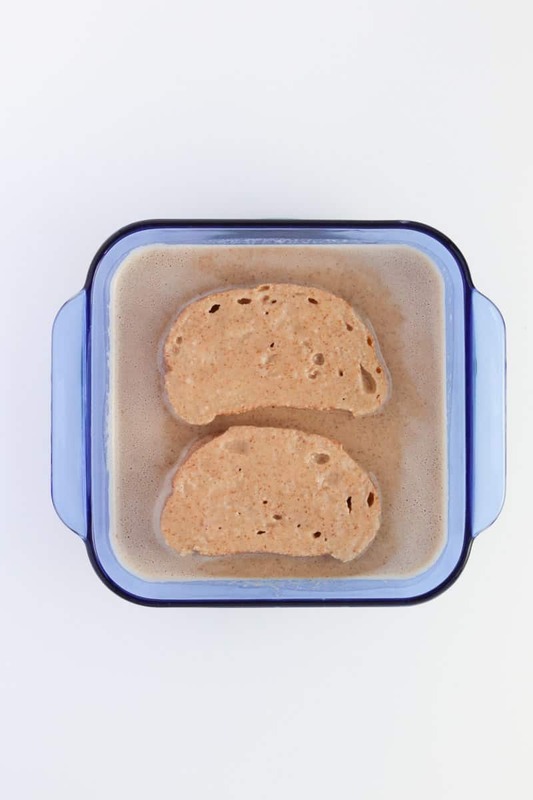 Soak 2 bread slices at a time in the batter, turning over to thoroughly saturated the bread on both sides. Wipe the non-stick skillet clean. Heat about 1/2 tablespoon of vegan butter on medium heat. When the butter is hot and bubbly, add 2 soaked bread slices. Cook 3 minutes per side, on medium heat. Repeat with the remaining bread slices. Top with reserved apple slices, and if desired, toasted walnuts, vegan butter and maple syrup. To keep the cooked French toast warm while you prepare the rest, place them on an oven proof plate or baking sheet in a 140 degree warm oven.